Over 150 members of the Hayling Scouts joined others from Havant District at our annual St George's Day service. This is an important date for us all, as St George is the Patron Saint of Scouting and each year we remake our promise, to do our best. This year we filled two double decker buses much to the amazement of those in Havant watching us arrive. Thank you to those who joined us. 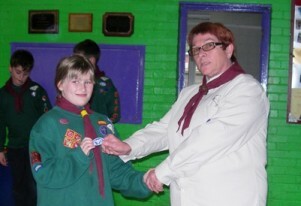 and Alex Diment of Lion Troop who all received their awards from Nigel Valette, District Commissioner for Havant. Abi and Ed attend Windsor with the Queen. Each year, those who gain the Queen's Scout Award are invited to a special St George's Day Service and Parade at Windsor Castle. In the afternoon the holders of this award parade into the centre of the Castle where they are inspected by a member of the Royal Family. 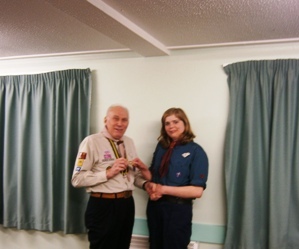 This year the presence of Her Majesty the Queen made it even more special for Abi Peett and Ed Harrison who received their Queen's Scouts Awards in 2011..
Congratulations to Clementyne Barrett of Mars pack on receiving her Chief Scout's Silver Award from Mandy Hawke. Our next book sale takes place on Saturday 9th June at the URC Church Hall in Mengham, starting at 9:30. There will be 8000 books to choose from, covering a great range of authors and topics. If anyone would like to spare an hour of their time to help us, either on or before the day, then please contact us. 21 Explorers and 3 Leaders have started their planning and fund raising for their 2013 expedition to Kandesteg Switzerland. This Scout centre, at the foot of the Swiss alps, offers a fantastic range of activities including some unique opportunities to test skill and stamina. This year includes special features on the International Jamborees attended by Hayling Scouts in 2011, stories and displays from our sections including the "Smash" camp last June and a chance to see and hear about some of our activities. This year we will be joined by the Mayor of Havant and the County Commissioner for Hampshire Scouting. Why not come along and support the efforts of your child's Leaders who give so much each year - who knows, like many others you may actually enjoy yourself. Wanted - a Minutes Secretary for the Group Development Team (GDT). With Helen Pickles having moved across from this role to take on the Leadership role of our new Beaver Colony, we now have a gap in our GDT. The role is exactly as it states, to record and publish the actions and minutes from our six meetings a year, plus those from our Annual Awards meeting. The meetings last about 2 hours and Helen spent a further hour on producing the minutes and distributing them to the members. If you can help, please contact Ian Hawke or Philip Blosse who will answer any questions you may have before making your final decision. Thank You. The basis is an “Olympic” style challenge day when all those taking part will have a chance to have a go at a range of activities, some traditional and others more unusual and gain medals for their territory. The day also provides the chance for the different age sections to see each other in action. Drinks Bottle (Drinks will be provided by us throughout the day). 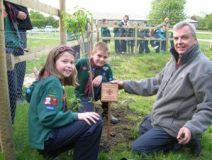 Well done to Jupiter Pack who collected funds to purchase a special Cherry tree which they then planted as part of the Queen's Jubillee celebrations. You can see the tree and plaque at the Tea Rooms at Northney Farm. All Jupiter Cubs and Leaders would like to thank Mary, Stan and James Pike for their support. You can see more photographs on our website in the special news item.